This article provides a brief history of radiators and central heating, describing the developments that have led to the current boom in “feature” radiators. May 5, 2011 - PRLog -- When it comes to renovations, choosing the right radiators is now often considered along with the wallpaper and floor coverings. Many consumers are keen to select radiators from the right era, to bring stylish authenticity to a period property, or to opt for a funky radiator design, to add the wow-factor to a contemporary interior. Research makes it clear that many changes have taken place in heating products over the years. As many history buffs will be aware, the Romans were the one of the first to use “central heating” to warm their villas using a system called a hypocaust that used a furnace to heat air and conduct it through voids under floors. Similar systems were also used in ancient Korea, possibly even dating back to the Bronze Age. By 1700, Russian engineers had started designing water based systems for central heating. Steam-heating systems were then developed and installed in the 1830s. The first was installed in the home of Governor of the Bank of England, John Horley Palmer, so that he could grow grapes in England's cold climate. However, there are various people who are claimed to have invented the radiator as we would recognise it today. All evidence points to their development occurring sometime around the mid 19th Century. Franz San Galli, a Polish-born Russian businessman, invented an early form of radiator between 1855-1857, and two distinguished inventors known as Joseph Nason and Robert Brigss also designed and produced a radiator using vertical wrought iron tubes screwed into a cast iron base in 1863. In 1872, Nelson H Bundy came up with the “Bundy Loop”, a popular cast iron radiator design that is still reflected in products we see today. The Victorian period is greatly associated with the introduction of cast iron radiators that we are all familiar with and it was in this period that heating became not only a practical installation but also a decorative item. However, it wasn’t until the 20th Century that radiators were popularised as even up to the 1970s comparatively few homes had central heating. Steel was then introduced as the most popular option for radiator manufacture in the UK, supporting the British steel industry. Consequently, pressed steel corrugated panels became commonplace, despite the prevalence of aluminium radiators elsewhere in Europe. 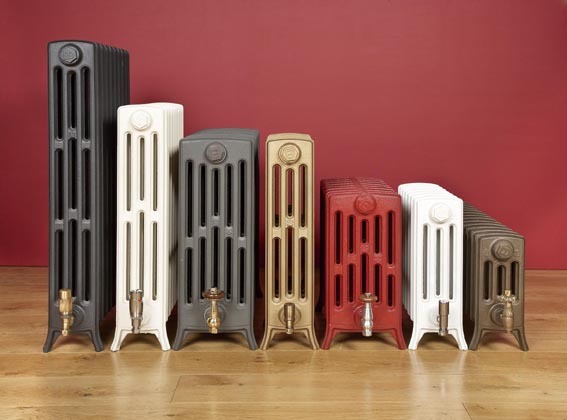 As interior fashions changed cast iron radiators were thought of being too big and obtrusive and steel radiators were consider ugly, so homeowners discarded them, boxed them in or simply painted them, but in the 21st Century we have seen the radiator market come full circle. Yet again radiators have become a desirable feature in our homes. Cast iron remains a popular choice amongst today’s heating engineers and architects, particularly for older properties that could otherwise be prone to damp. Radiators made of cast iron stay warm long after the central heating has been turned off, providing a constant, gentle undulating heat, which retains the warmth in the fabric of the building, as well as heating the interior space. Today’s trend of restoring period properties back to their original splendour has re-launched the cast iron radiator that now claims pride of place in many homes. Cast iron radiators available today are either “reclaimed”, meaning they have been salvaged from older buildings, or “reproduction”, meaning they are new but have been cast from original designs, with both options having a boom in popularity over the last decade. See our blog article “reclaimed vs. reproduction” for more information on this subject. Contemporary radiators are now available in wide variety of wonderful shapes sizes and finishes, from sleek minimalist radiators that fit close to the wall to wow-factor feature radiators that make a unique and stunning statement. Yet whatever style you opt for, be assured that there is no need to compromise on heat output, as good looks and performance are not mutually exclusive. Radiators, be they Victorian in style or ultra-modern designs, no longer have a ‘humble’ status within a room; they are now an essential centrepiece that serves a functional purpose as well as being a stylish accessory to complement any interior. Superb range of contemporary, cast iron & electric radiators & towel rails at competitive prices. With over 150 radiators on display, unrivalled customer service & nationwide delivery, we are widely recognized as the UK's leading radiator specialist. Why do chrome radiators have a lower heat output?